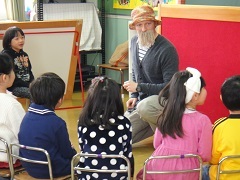 Today was the Open English lessons for the senior children. In Class 7 children had a team spelling game. They had to work together and spell the words apple, bag, girl, tent, and umbrella. The whole class did very well. After that we had our main activity. 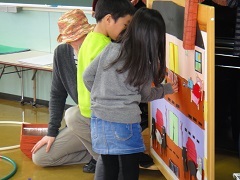 The children had to take the role of different people from around the world. They then had an introduction conversation. Boys went first, then girls, and finally the whole class. Because they did so well they got flag painting craft for the green board in Class 7. Well done Class 7. 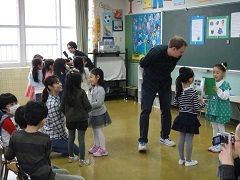 Today in Class 8 and 9 the children sung the English song they have been learning for their parents. It was pleasing to see them singing with such big voices and energy. The children also had to help Grandpa Joe get new furniture for his house. The children did this by answering questions about the five senses and going to a shop to get furniture. After spelling furniture words like bed, sofa and rug the children got a special key from Grandpa Joe. The key opened a box revealing recipes for the cooking class tomorrow. I was pleased with the effort from both Class 8 and 9 today and hope they will enjoy the upcoming English lessons. Thank you to all the parents of the senior children for coming.